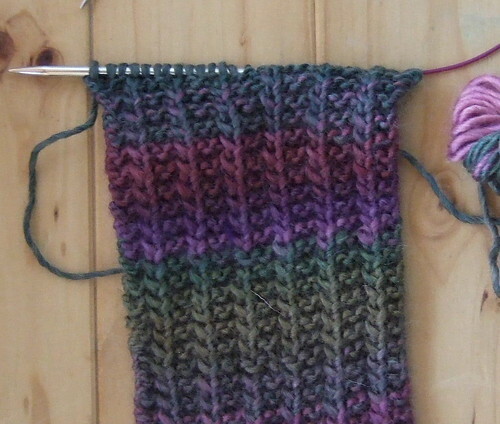 I’m also working on a scarf out of some Mille Colori, can I just say how much I LOVE this yarn?? It’s so soft and works up at a nice speed and the color variations are just gorgeous (mine has some more pinks, greens, and browns in it than yours, tho i’m digging the purples you’ve got there). isn’t it nice to have a good fast simple pattern so you can just get something DONE? Mmm instant knitted gratification…. That yarn is gorgeous! Thanks for linking to the pattern, I may have to give it a try! I know what you mean when you say “I only use circular needles now, even for small things like scarves, and these are nice…” Me too!!! I don’t have the Addis but I like knitting and being able to let go of one needle. I don’t need to worry of loosing the needle or if my purse is big enough to carry my project. In a cafe the circs are so convenient. I grab a comfortable armchair and knit away.